Justin is intrigued by the lively bohemian baker, but the last thing he’s looking for is a relationship. His own romantic failures have proven that the demands of his job are incompatible with meaningful connections, and he’s already pledged his life savings to a new business venture across the country—an island air charter in Florida with his sister and brother-in-law. Against their better judgment, Melody and Justin find themselves drawn together by their unconventional career choices and shared love of adventure. But when an unexpected windfall provides Melody with the chance to open her dream bakery-café in Denver with her best friend, chef Rachel Bishop, she’s faced with an impossible choice: stay and put down roots with the people and place she’s come to call home . . . or give it all up for the man she loves. Like most females, baking is encoded somewhere deep down in my DNA. Call it nature or call it nurture, but at the earliest age, I figured out that the cute boy in my English class would talk to me if it involved chocolate chip cookies. Got my heart broken or had a friend betray me? I grabbed the mixing bowl and went for the brownies (even better if they’re served à la mode.) My friend was having a birthday? I made a cake drowned in pounds of buttercream. I quickly graduated from the boxed mixes to the real thing when I got married and had a kitchen large enough to roll out dough. I would comb magazines for the best recipes and spend my weekends trying them out. I quickly became known for bringing beautifully iced Christmas cookies and delicious homemade cakes to work. Then my husband and I moved our young family from Los Angeles to Denver, a relocation that was about 1000 miles northeast and 5000 feet up. Suddenly, every recipe I’d perfected in the previous eight years failed. Cookies burned to crisps, cakes fell, and don’t get me started on candy making. Gradually, I adapted my recipes (my beloved never-fail Toll House recipe took eight tries to get right) and even became an avid artisan bread-baker. Then disaster. Or at least, what a baker would consider a disaster. After developing chronic health problems, I discovered that among other things, I was sensitive to gluten. The horror! In order to heal, I turned to the paleo diet, which eliminates all grains (there goes most gluten free recipes) and all processed sugars (there goes everything else). I’ve tried baking paleo-style, and while I can now make cakes that even my gluten-fiend family enjoy, it’s just not the same. So what’s a once-obsessive baker do when she can’t eat her creations? She bakes for other people and goes on faith that they actually taste good… considering she can’t taste them herself. It struck me that there was a spiritual lesson in that, and an obvious tie to Brunch at Bittersweet Café, which deals in large part with Melody’s faith journey. There are times when we have no idea if things are working out the way they’re supposed to, in which case we just have to trust the “recipe” and the input of friends and family who love us. Sometimes our instincts tell us when we’re off track, and sometimes we need that outside nudge from our “taste-testers” to put us back on course. In any case, what Melody and I have in common is that we both bake to show our love for the people around us. And the process of baking my favorites, even knowing that I can’t enjoy them myself, can still be a selfless way to show people they’re important to me. Fortunately, macarons, which happen to be made with almond flour, are still on the menu. There is so much to love about Brunch at The Bittersweet Cafe, the second book in Carla Laureano’s Supper Club series. Engaging characters you wish were really real (and your friends 😉 ), a vibrant culinary setting, a realistic romance, and faith issues that resonate deep within the heart — those and more are what you will find. This novel is very highly recommended! Melody and Justin meet by chance when Justin’s car is stuck on Denver’s snowy streets. The unexpected encounter sets the two reluctantly on a course of love which one tries his best to avoid and the other views as just another opportunity for a broken heart. Trust issues, aside, the two main characters have a hard time viewing relationships without the perceptions and expectations formed from their pasts. Fears of commitment and abandonment run deep. They embark on a temporary dating journey that leaves them unsatisfied and longing for more. But these two — oh, how I loved Melody and Justin! Sensitive and adventurous, charming and caring, these two make the perfect couple — except for all the angst their author subjects them to. LOL! Seriously, Laureano’s plot is just right, and the romance simmers like a hearty soup. Did you get the food reference? Yes, this book is filled with baking and eating and baking some more. Its pages sent me to foodie pages looking for recipes that this amateur could perhaps master. Can you gain weight by vicariously consuming pastries and bread? Thankfully no! A subtle faith thread was woven throughout until it came to full fruition in revelations for both Melody and Justin. Their discovery of true faith was beautifully detailed. 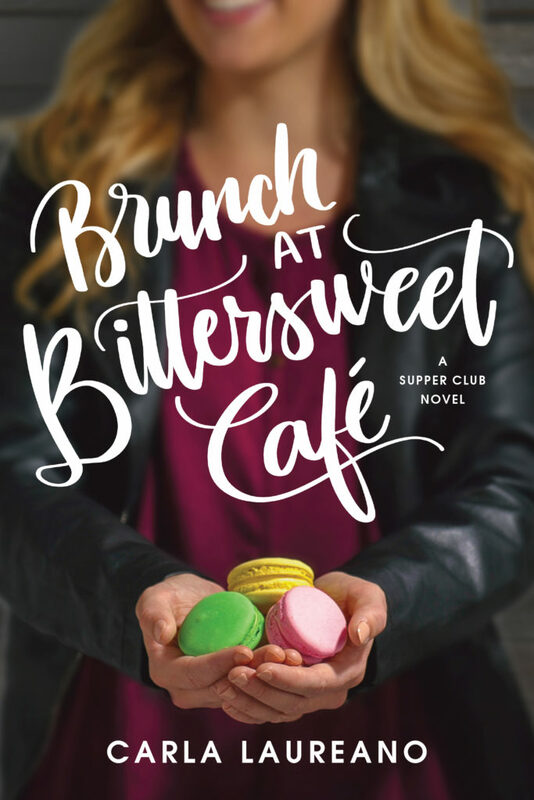 While Brunch at Bittersweet Cafe is the second in the Supper Club series, it can be read as a standalone. But I suggest you get both — you are in for a yummy reading experience! 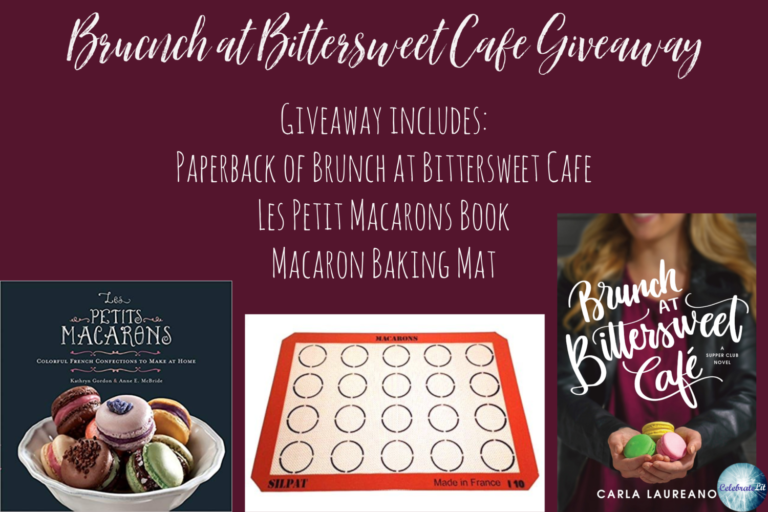 To celebrate her tour, Carla is giving away a grand prize package of a macaron baking mat, a macaron book, and a paperback copy of Brunch at Bittersweet Café! !